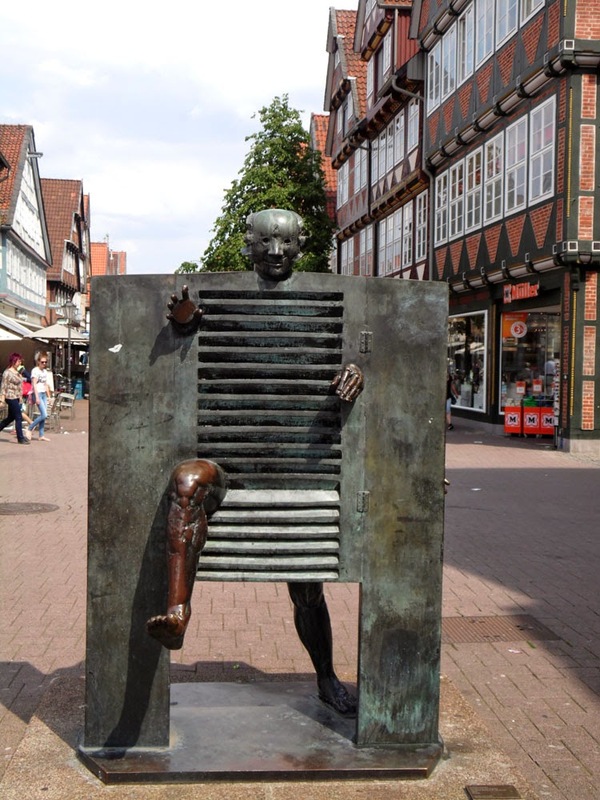 Whilst wandering around German towns I am often impressed that the town-planners have added interest to the urban street-scene by installing visually arresting sculptures. Sometimes the sculptures don't hit the mark, and sometimes they are just sad remnants of Social Realism from the days of the East German regime, but at least the local Burghers have made an effort. Sculptures are the art-form most suited to be seen at street-level: they can be viewed from any angle and are made of durable material that can stand the assaults from the weather and scrubbing brushes trying to remove the inevitable patina of graffiti. 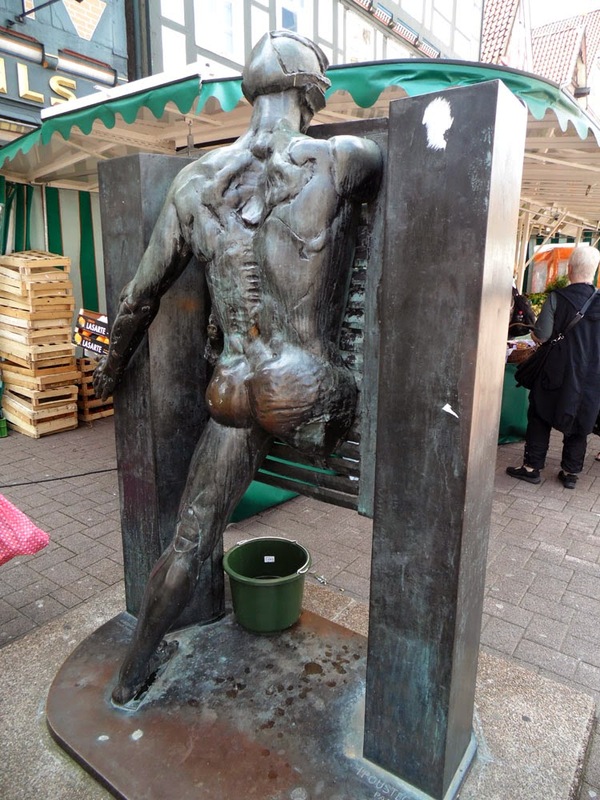 As an example, here is the bronze sculpture 'Homme passant la porte' (1966) - Ein Mann durchstößt die Pforte - by the amazingly original French sculpture Jean Ipoustéguy, which I came across at the corner of Poststraße and Stechbahn in Celle on a busy mid-week market day. What I particularly like about this sculpture is the sense of movement created by the front and back positioning of the man's arms- if you look, he actually has three arms, as if he has moved one through the door in the time it took you to walk around to the front of the statue. And that leg sticking out gives it forward motion, propelled by those well-delineated muscles in the back and shoulders. What it is supposed to depict is anyone's guess. For me, that is the kind of art that moves me most. The clue seems to be in the circular disc he is holding in his right hand; I am thinking of a portal between two worlds, and I am thinking of Charon's obol - the obolus coin given to the ferryman to transport souls across the river Acheron to Hades. Therefore it is the passage between life and death, which at first seems to be a closed door, but in fact is an illusion. The serene, almost comical, face shows no horror at the transition, though he does look like he has had an accident with a bike helmet. 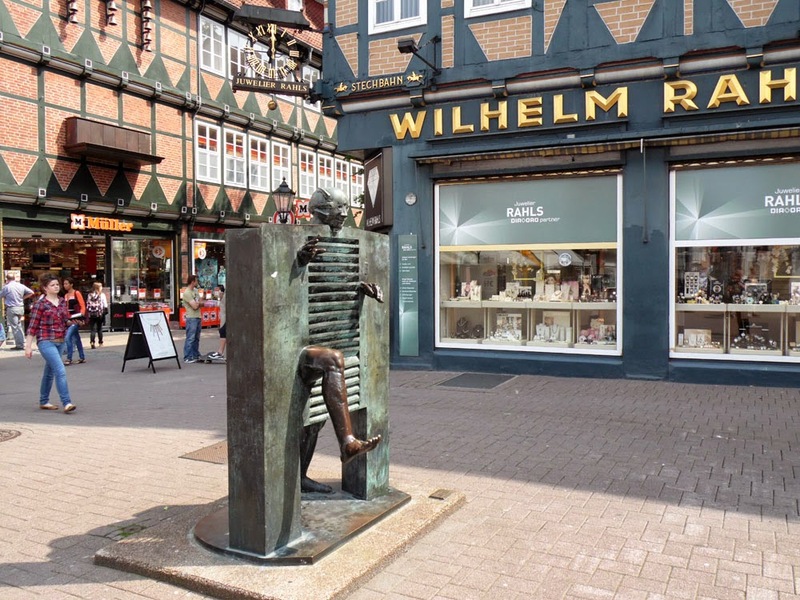 Amazingly, Celle actually has two sculptures by Ipoustéguy. The other is 'Lecture', in front of the Stadtbibliothek on Arno-Schmidt-Platz. I've only just found out about it, so no photos, but you can see one of it here. You might think that Celle has enough at street-level to keep the optical nerves tingling - it does have nearly 500 half-timbered houses after all - but I think it is this frisson between the old and the new that prevents the German Altstädte from becoming static museum pieces and instead be vibrant centres of German life. If you are looking for a professional photo of this sculpture, check out Statue Homme Passant La Porte at jwoodhouse.com.